In these tragic hours, while witnessing the atrocities of Israeli military occupation in Palestinian lands, the brave resistance of Palestinian women and men, and the courage of Israeli and international pacifist activists, we feel we must do something quickly and effectively in order to stop the ongoing massacre. Actions are due if we wish to preserve any spark of hope from destruction. We cannot wait while Sharon’s criminal arrogance, supported by part of the Israeli Labour party, tries to extinguish all critical understanding in Israel. There will be no permanent and just solution to the current conflict if they do not recognise the Palestinian people’s historical right to have their own independent and sovereign state. What has been cynically offered to Palestinians so far is a humiliating collection of territories. We have to denounce U.S. military support of Israel, and the terrible risks this policy entails for our future. As a justification for its attitude toward the Palestinian conflict, the U.S. government is boasting about the need to fight terrorism, and showing once more its absolute indifference to international laws. We firmly believe that the language of violence, used by Bush and Sharon as a political strategy, will only enhance hatred, desperation, and terrorism. Our need to act is not only based on the wish to stop manslaughter in the Middle East, and save the lives of Palestinian and Israeli women and men, but is also an effort to save our own life and future. 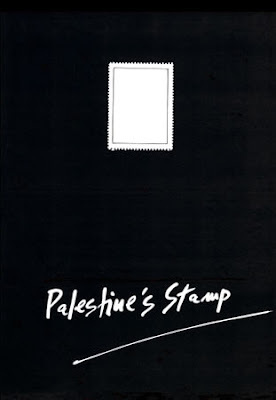 Twenty years ago we created “Kufia, Italian pencils for Palestine” with the help of many artists and associations supporting the Intifada. 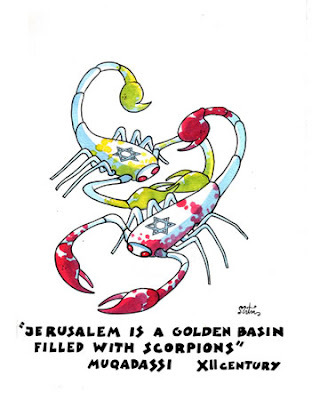 An exhibition of the artists’ original drawings toured more than 70 towns in Italy, Israel and Palestine, including Jerusalem. Prints of the portfolio were sold to raise funds to support Palestinians’ rights over their land and their right to return to their land. Today, we wish to re-launch the Kufia campaign and possibly to widen it. Together with il manifesto, l’Alfabeto Urbano, Mano magazine, and other political organisations and press companies, we are now working on a new edition of the portfolio and exhibition. 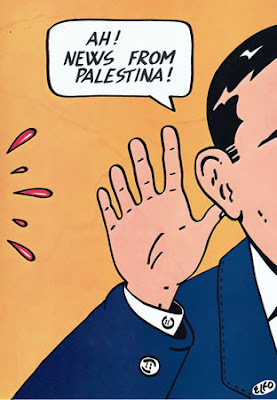 It will host major Italian comics artists and, hopefully, Israeli and Palestinian artists (as in the past edition). Although we know that humanitarian support and alternative information - offered by important associations such as “Emergency”, “Un ponte per”, “Action for Peace”, “Peace Brigades Interna-tional”, “Indymedia” and others - is absolutely fundamen-tal to many areas in the world, we still think that more can be done in the field of communication, culture, and art for the sake of Palestine. We want to bring together different experiences, all stemming from Palestine’s emergency call, and develop new theoretical and practical strategies. In the following days more information on Kufia will be found in the newspaper il manifesto, including the different steps of our project and other coming publications. Contributions: Mark Merkeke, Xavier Torcelli, Vauro, David Vecchiato, Oscar Zarate, Andrea Accardi, Giorgios Botsos, Andrea Bruno, Giorgio Carpinteri, Onofrio Catacchio, Blaise Dehon, Elfo, Marco Ficarra, Giacon, Gabriella Giandelli, Nabil Hanani, Jean Lamore, Jean-Christophe Long, Sliman Mansour, Mark Markeke, Marina Comandini, Leila Marzocchi, Josè Munoz, Rula Halawani, Daniele Brolli, Gianluca Costantini, Marta, Squaz, Cinzia Ghigliano, Arnon, Oreste Zevola, Daniele Scandola, David Reeb, Filippo Scozzari, Giacon, Guido Crepax, Erika Pittis, Lorenzo Mattotti, Magnus, Sliman Mansour, Taleb Dweik, Taysser Barakat, Milo Manara, Vera Tamari, Paper Resistance, Ale Staffa, Rocco Lombardi, Marco Corona, Mimmo Manes, Giacomo Nanni, Gipi, Guy Vandervoorde, Paco Desiato, Matteo Bergamelli, Stefano Centonze, Tayseer Barakat, Vincenzo Apicella, Maurizio Ribichini, Alessio Spataro, Serge Ricco, Miki Kratsman, Alessandro Pessoli, Bertrand Panier, Giuseppe Palumbo, Michelangelo Setola, Mark Merkeke, Franco Matticchio, Andrea Pazienza, David B., Igort, Marina Comandini, Vanna Vinci, Sara Colaone, Davide Catania, Renato Calligaro, Maicol & Mirko, Elena Rapa, Miguel Angel Martini, Raul, Enea Riboldi, Davide Reviati, Aleksandar Zograf, Joe Sacco, Matteo Bergamelli.